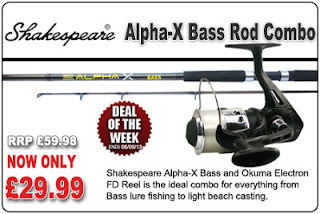 Deal of the Week is the Shakespeare Alpha-X Rod and Okuma Electron FD Reel - RRP £59.98, now only £29.99! The Shakespeare Alpha-X Bass 11ft is a quality 2 piece, versatile rod that is capable of everything from Bass lure fishing to light beach casting. Couple this with the Okuma Electron FD Reel with it's graphite body and rotor, free line and smooth front drag system and you're also sorted for Mackerel fishing off rocks and piers too! Grab yours while stocks last.